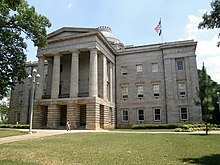 ^ "State Capitol of NC". NC Department of Cultural Resources. Retrieved 2006-08-04. ^ a b "Structure of the North Carolina General Assembly". Official North Carolina General Assembly Website. Retrieved 2006-07-23. ^ "Marker: A-13". Ncmarkers.com. Retrieved 2012-05-18. 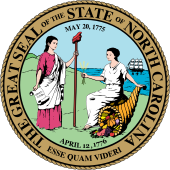 ^ "Women In The North Carolina General Assembly 1921-2007" (PDF). Archived from the original (PDF) on 2007-10-25. Retrieved 2007-10-21. ^ Reilly, Ryan J. (27 Feb 2013). "Voting Rights Act Supreme Court Case: Scalia Condemns The 'Perpetuation Of Racial Entitlement'". The Huffington Post. Retrieved 13 July 2013. ^ Lengell, Sean (Feb 28, 2013). "Scalia 'racial' comment on voting rights law draws fire". The Washington Times. Retrieved 13 July 2013.